Venice Boulevard was newly redesigned to increase pedestrian safety in downtown Mar Vista, while maintaining a steady flow of traffic and ample parking. 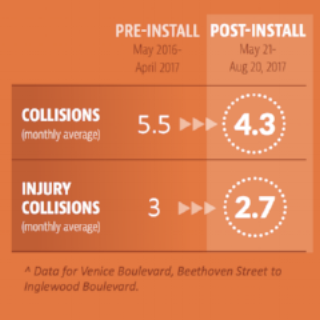 LADOT is closely monitoring the project, and the latest 3-month data benchmark shows a reduction in drivers speeding over 40 mph, as well as fewer collisions and injuries on the street. Traffic flow is also nearly back to pre-project levels, with most trips through the corridor within 60 to 90 seconds of pre-project times. We expect to see further reduction in travel times along Venice Boulevard, and will keep you informed each step of the way. For more Data & Project Evaluation information, click here. To see the latest Project Updates, click here.